My Great Grandfather, William Hosea Peeples and his brother, Joseph Henry Peeples, were both in Co K, 29th GA Infantry. William was wounded in his leg at the Battle of Jackson and Joseph died of chronic diarrhea and is buried at Lauderdale Springs, MS.
3rd brother, John Wesley Peeples, was in Co G, 29th GA and died in 1875 from wounds he had received during the Battle of Jonesboro. John was married to Linda Dobson, daughter of James. She latter married a Connell and move to FL. I am searching for the grave of my Uncle John who I believe is buried in the Berrien County area. Any help I would be appreciated. Your articles are always so interesting and well researched and appreciated. Jeanette, the Connell was my 2d great grandfather. 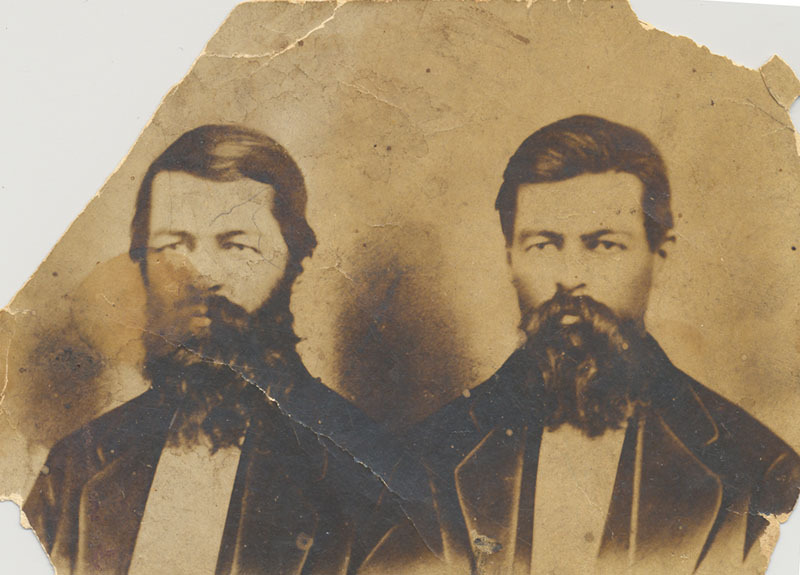 He is shown here, left, with his twin brother, Henry. My great great grandfather Albert Benjamin Douglass appeared as one of the 29th Georgia Infantry deserters. He actually had a colorful record of service to which I add the following details to relate, ” the rest of the story”. A. B. Douglass service probably begins when he appears as a 2LT in Co H, 25th Battalion Provincial Guard Georgia Infantry Regiment a local militia unit. The fact that the unit is termed ‘provincial’ typified early temporary military formations awaiting formal recognition or organization. In 1862 he enlisted in Co K, 29th Georgia Infantry posted to duty near Savannah, Georgia. Albert Douglas was reported by his unit the Berrien Minute Men “absent without leave” in December 1862 and was marked “deserted.” Records reveal that Albert Douglas(s) had actually deserted the 29th Georgia and enlisted in the 26th Georgia Infantry subsequently fighting with Army of Northern Virginia in Virginia. As early as June 1862 he appeared with the 26th in Richmond, Virginia. He continued to serve in the combat arena but shows a history of being plagued with sickness and transferred to hospitals in Richmond, VA where he was discharged from the 26th GA on June 4, 1863. He returned to south Georgia and a few weeks later in July 1863 is found enlisting at Lake City, Florida in the 9th Florida Infantry. He returned to the combat scene with that unit fighting in Virginia. Records reflect on several occasions he again is reported sick and frequently in hospital and until being discharged from the service at Petersburg, VA in November, 1864. The same month record reflects his desertion to union forces and appears as a prisoner of war in Ohio where records indicated a change in his status. He took the Oath of Allegiance in December 1864 to the United States, falsely stating his birth as Atlanta, Georgia. The same month at Cincinnati, Ohio Albert enlisted for two years as an Ordinary Seaman in the US Navy and was posted to riverine warfare on the Mississippi serving on the Receiving Ship Cairo and USS Gazelle. He soon reported sick to the US Naval Hospital in Memphis, TN and deserted March 30, 1865 from the US Navy while in the hospital. His whereabouts after that point are unknown. He did not return to Berrien County and left descendants through his daughter Francine Shaw Douglass. His wife was Abygail Franciene Shaw the daughter of Martin Shaw.